Happy Friday! I hope you have all had a great week! I have had a good one but a busy one (as always). However, I did take the time to do a little retail therapy. You can find out below which of these items ended up in my shopping cart. Which of my picks is your favorite?! 1. 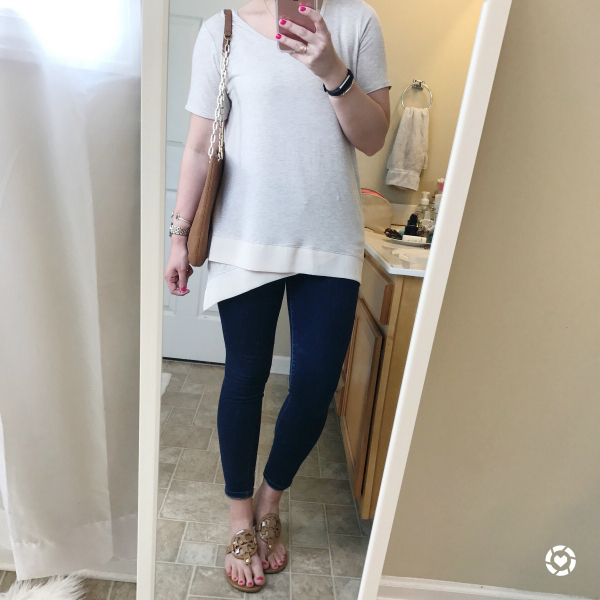 Ruffle Top | If it's off the shoulder and has ruffles, then I currently love it! All of the tops I've currently drawn to right now are one or the other or both. 2. 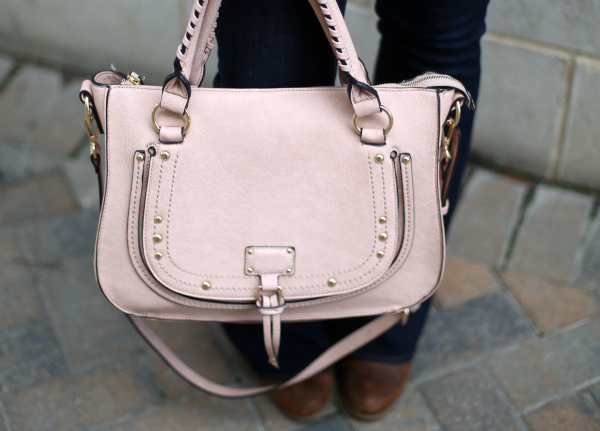 Taupe Bag | I have been debating on this bag for a couple weeks and I finally decided to order it. I love the structured style and the cute circle detail. I can't wait for it to arrive! 3. Knot Sandals | How cute are these sandals?! I've been searching for a pair of unique blush sandals and I think I have definitely found them! 4. 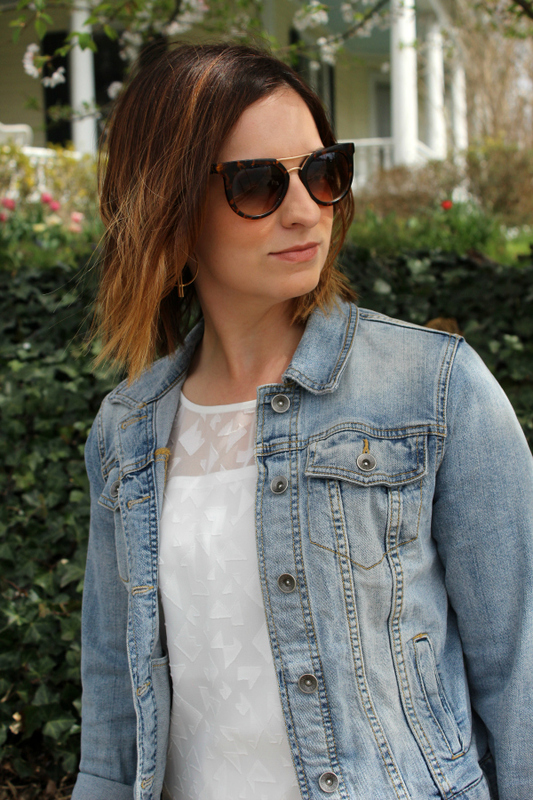 Sunglasses | These Karen Walker lookalike sunglasses are only $12! Y'all know I love some cheap sunnies and you better believe I ordered them. Yay for a good look for less! 5. 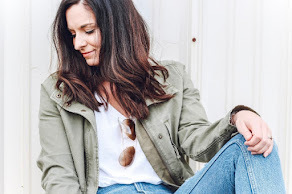 Denim Shorts | I looooove distressed denim but when it comes to shorts, it seems that all I can find is super short ones that are just not appropriate for this momma! I have the length and the loose fit of this mom friendly pair. 6. 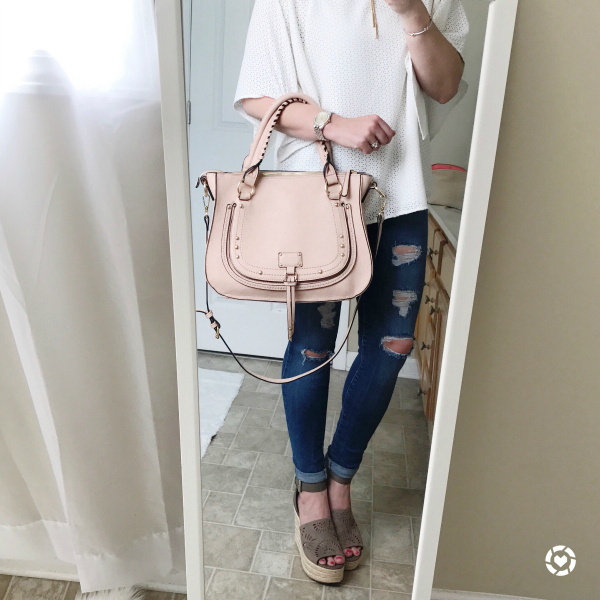 Pink Heels | These heels are also a recent purchase and they are under $40! I have been hunting for a pair of bright pink heels for awhile now and these are so perfect. 7. Hat | These spring days have been dreaming about the beach! I'm busy planning trips and this hat definitely needs to make the trip. I love the pom pom detail! 8. Earrings | These earrings were sent to me by Sugarfix and they have become a new favorite! If I'm not wearing leather earrings then I'm wearing gold hoops. This pair is less than $10! Hey y'all and Happy Thursday! 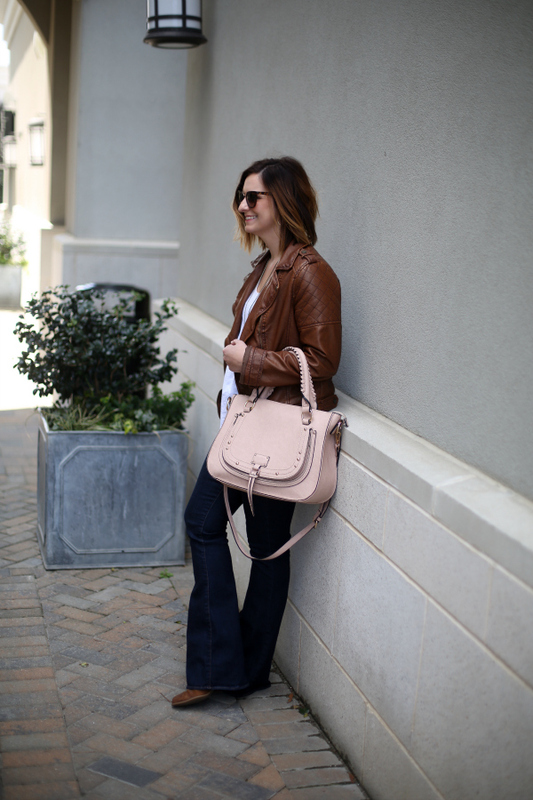 Today, I'm sharing what I wore to the Style Collective brunch that I attended in Raleigh a couple of weeks ago. It's not what I planned to wear but the weather just wasn't cooperating with my wardrobe choices! I was struggling between wanting to look "springy" and just really wanting to be warm. This time of year can be super tricky when it comes to getting dressed so my biggest tip for tackling this problem is to dress in functional layers. 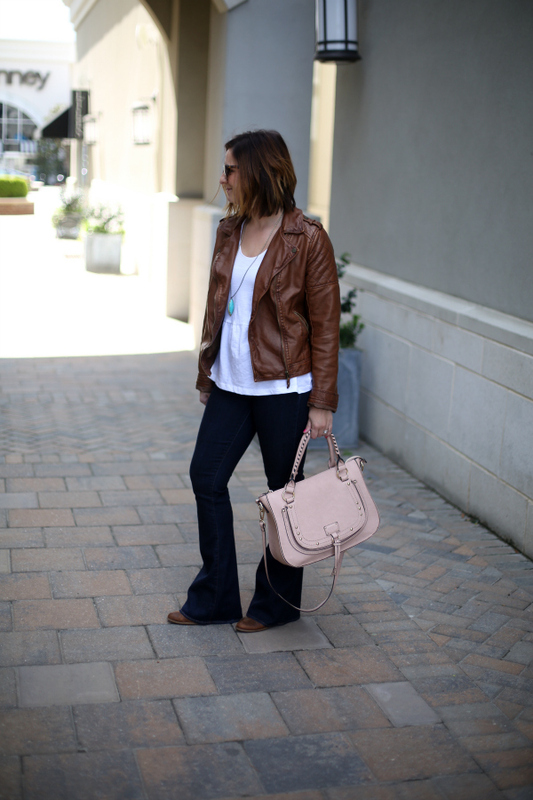 I styled by budget friendly faux leather jacket with flared denim and ankle boots. 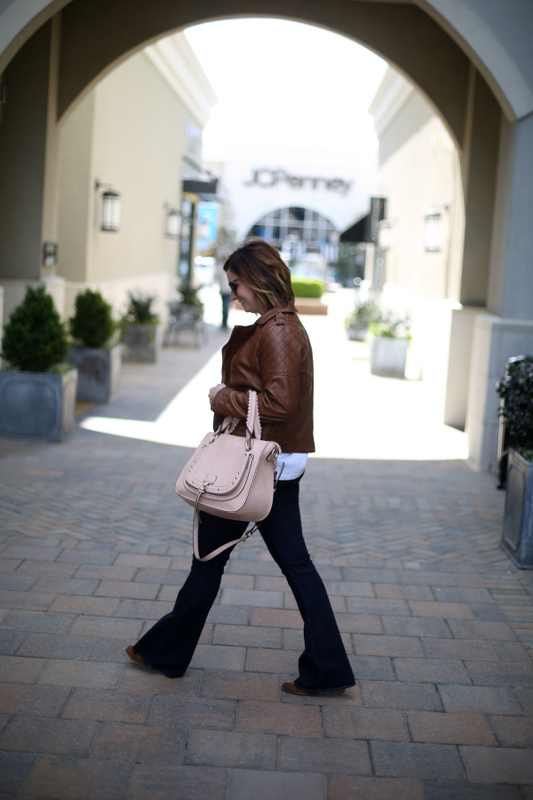 Flares are such a nice break from skinny jeans! 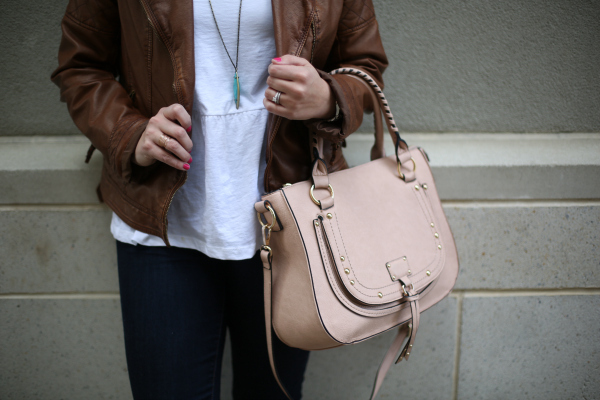 I wore a basic white peplum top and added some color with my Kendra Scott necklace as well as my blush bag. At the restaurant, I was able to take my jacket off because the temperature was comfortable but I definitely needed the jacket outdoors. 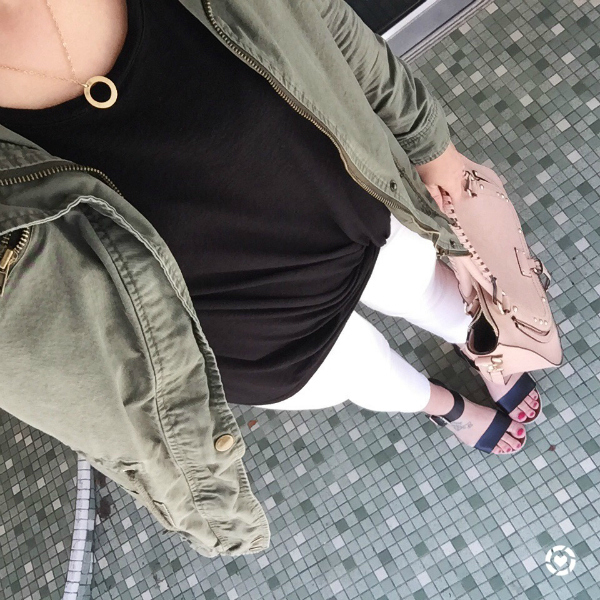 This look would also be great for any spring day because the morning temperatures are always much cooler than the afternoon so you can just lose the jacket as the day go on. 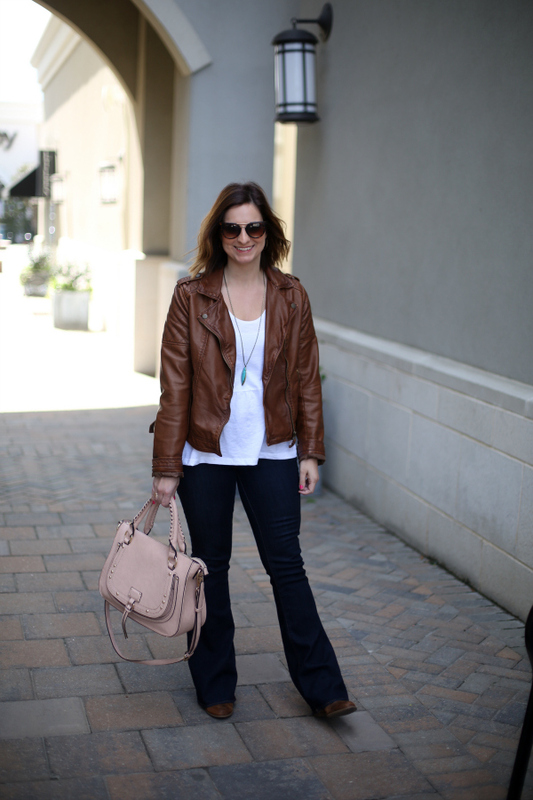 I love layering! Have a great day, everyone! Thank you so much for stopping by! Hey y'all! My husband and I are currently watching Parenthood together (in the middle of season two) and I'm watching Gilmore Girls (end of season five) on my own. Where have these shows been all my life?! Lauren Graham is just the best actress! I didn't watch my much TV while my girls were younger mostly because the channel was always set on Nick Jr. and when they finally went to bed, so did I. We also only have once television in our house and we got rid of cable. So now that we are in a different season of real life parenthood, we get to actually watch something we want to watch! Woo hoo! 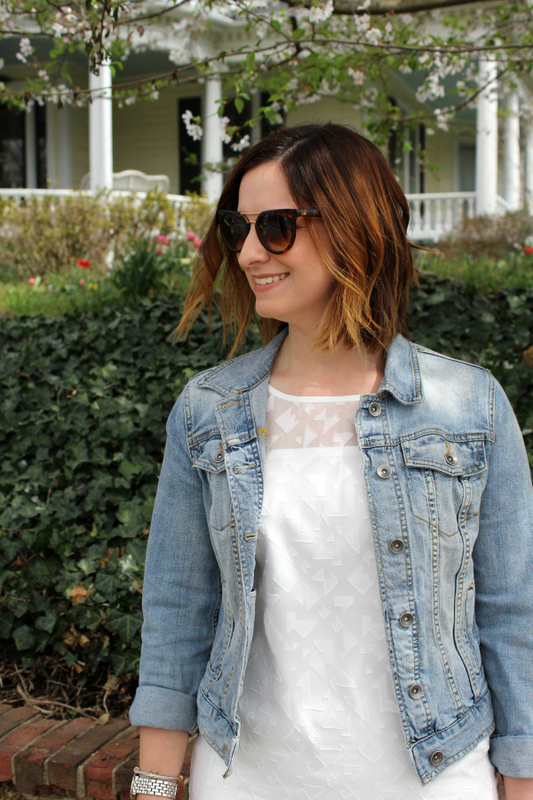 Today, I'm sharing an Instagram Roundup of looks I posted on my Instagram account last week. 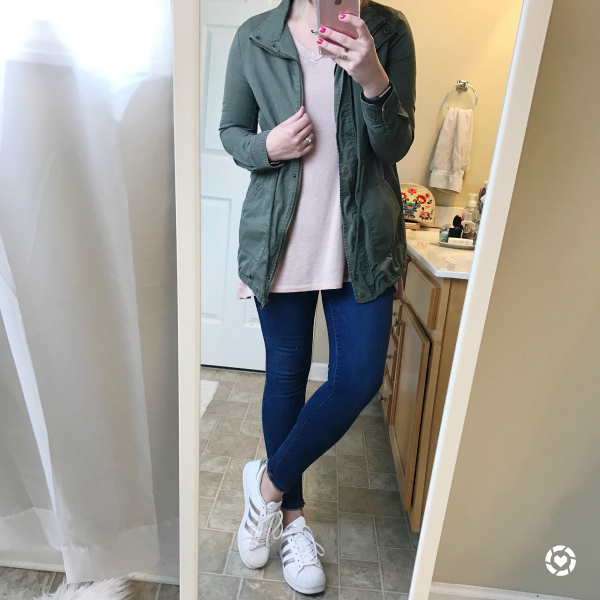 I have been living in neutrals and blush! I guess I like what I like. I hope y'all have a wonderful Wednesday! Hey there and Happy Tuesday! 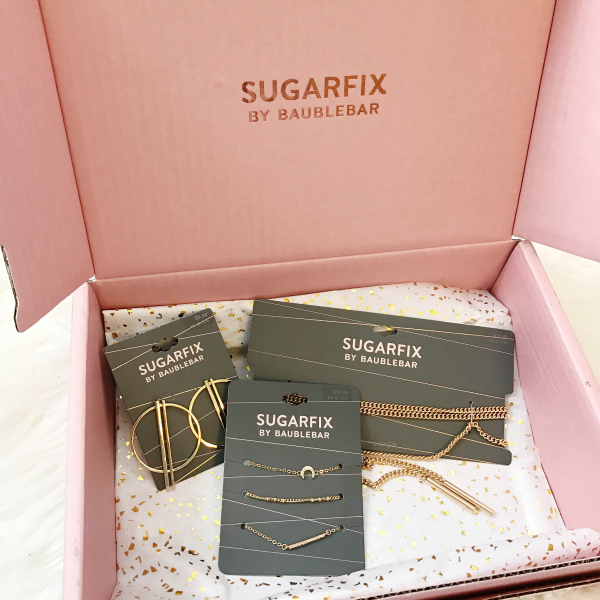 Today, I'm so excited to share several gorgeous pieces of jewelry that Sugarfix by Baublebar sent me! Getting this fun box in the mail was definitely a happy mail day. It even came with chocolate! All of these pretty jewels are available to purchase at Target and the prices are amazing! I've always been a big fan of Baublebar so I'm loving this budget friendly and affordable collection so much. Style on a budget is my love language. 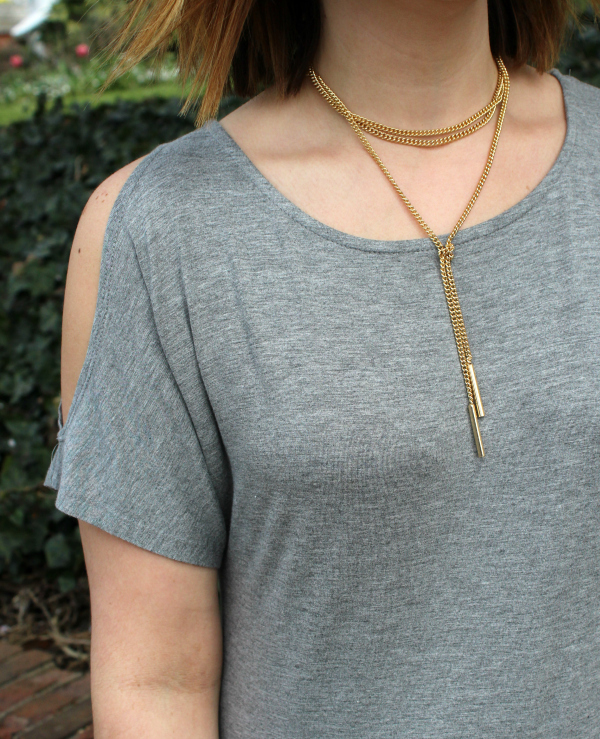 I styled the gold choker, bracelet set, and hoop earrings with an cold shoulder jersey maxi dress, comfy cognac espadrille wedges, and a neutral bag for an easy spring look. 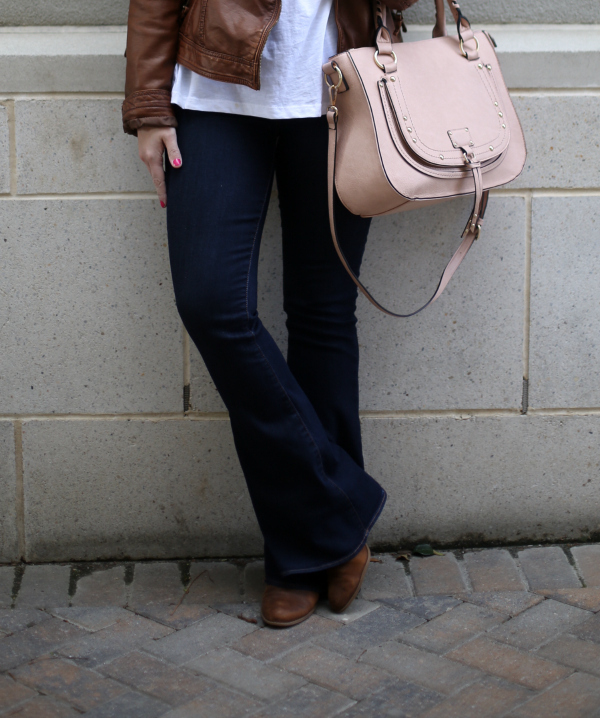 The accessories definitely make the outfit! I have been loving the look of choker necklaces but this is the first one that I have tried that doesn't feel like it's actually choking me, lol. 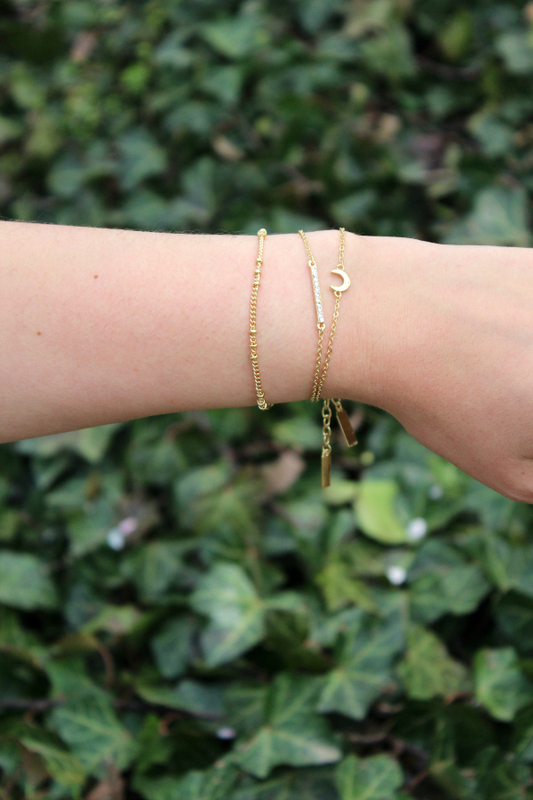 The hoop earrings were already on my wish list and the bracelet set is so dainty! 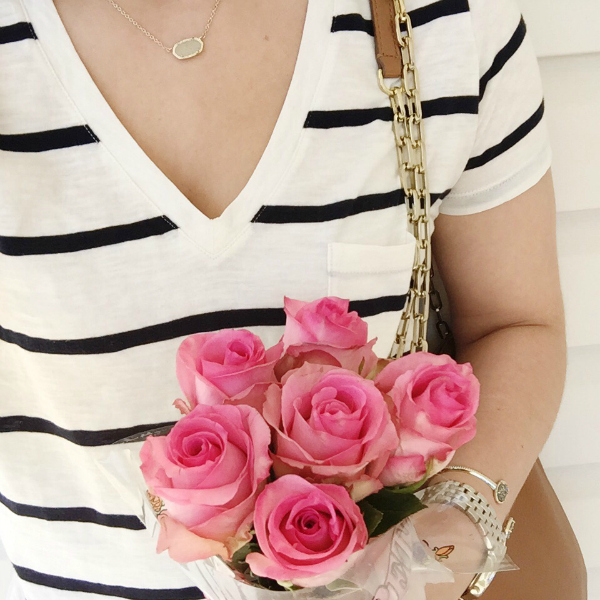 I am a big fan of simple, dainty jewelry so I absolutely loved everything in this box!